There is insight, hope, and inspiration to be found in connecting to each other in conversation about the realities of loving deeply, losing, and still living life to the full. This is worth your time, your reflection, your tears, and your celebration. There is so much good to be found in grief, friends. The first year overwhelms. The second year and beyond leaves room. And what you choose to do with the room is key. Loving deeply and losing someone you love so much is heartbreaking. Literally and figuratively. It is physically and emotionally devastating. Your heart gets shattered. There are too many pieces to count— all the firsts without the person who is so much a part of your life are almost too much to handle. It’s a continuous, new nightmare of heartache. Everything about the first year is unfamiliar and unpredictable and completely exhausting. You feel paralyzed in the pain and cannot wait to feel better. By the second year, the loss is not unfamiliar. You have been there for a while figuring out how to live in the void of the absence in your life. You know, more, what it feels like and looks like day to day, even though you don’t like it. The emotion is not so raw and heavy. And the absence leaves unwanted, empty space in your life. Your person is gone from your physical world. You have been forced to come to terms with that—but the love is right there—still alive inside of you and all around you—reminding you every single day of the person you miss so much. The love doesn’t ever go away. You have all this love you used to pour into your person, and it’s hard to know what exactly to do with it. That is the essence of your grief now. So you have all this love you used to pour into your person, and it’s hard to know what exactly to do with it. That is the essence of your grief now. Like me, you might find yourself questioning your grief as time goes on: Why not just avoid what doesn’t feel good? Why not just move on already? Is that what it means to heal? To ignore it, not think about it? To not remember? Is that what I am supposed to do? Let’s be honest. There’s pain in thinking about who and what you miss so much. You certainly don’t want anyone to think you are stuck in your grief. For me, that fear is real. But I promise you, that fear is not the truth for any of us. The truth is, grief is love untapped— unsure of where to go or what to do. 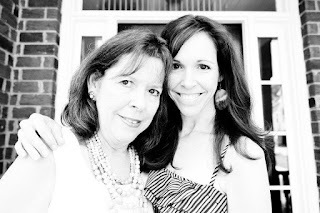 I found myself starving for my mom’s love and longing to love her back. I don’t know about you, but the hardest adjustment for me, has been that the love I want so much—I assumed it had to disappear from my life with time. And so the thought of time passing really scared me. Like me, you might have a not-so flattering confession about what your grief has looked like with time. And you need to do something about it. I often catch myself pushing love away and avoiding it in my own heartache. I check out and keep myself busy and disconnected to avoid even the possibility of too much emotion. This has been my coping mechanism. I may be physically present, but my mind wanders. I didn’t even realize I was doing it. And the thing is, it’s nearly impossible for others to detect. With time, I have been able to reach out to others in love. But receiving love from others and letting it really soak in has proven to be unexpectedly difficult for me. I am not sure why other than the fact that all I really want is my mom—and everything and everyone short of that is a reminder of what I am missing. I have to admit, I have created walls to protect my broken heart without really understanding what I was doing. The complicated part is, while love is the source of our grief, love is also the only way to heal. This is exactly why grief is not weakness in us, though it can feel like it. It’s just one expression of love among a zillion. So, if and when your love comes as grief, I hope you will give yourself a break from feeling guilty—no matter what anyone else says. Because I am learning, this is where and how grief has the potential to stretch and grow you beyond your own personal limits into more of the person you want to be and maybe didn’t know it. I hope you will find hope and help in my reflection. You are not alone. If you really want to help yourself and others in the midst of grief, love through and don’t give up. Friends, let’s learn from each other. We don’t ever need to fight love because we are hurting. Because that’s when love does the most meaningful work in us and through us. The best gift is to be loved through and to love others through — without giving up over time. WARNING (though): Loving others through their struggles is probably going to be tougher than you realize. It’s not for the faint of heart. Because really connecting to others in the middle of their hurting, still grieving hearts means they are extremely sensitive and vulnerable, tend to shut down at a moment’s notice, and don’t always make the best decisions. Your words and actions really need to be careful and kind, patient and thoughtful. Healing but hurting hearts are desperate for safe and gentle places to be still and feel whatever it is they feel— to talk about whatever it is they are going through some days—and space other days to take a break and not say a word. It takes selfless work to free yourself from spoken and unspoken expectations of how and what others should be doing in their pain, especially on the difficult days. To love others through means being there, showing up over and over again, and daring to understand what they are going through—not by comparing it to what you know your personal (limited) experience to be but simply by listening and letting hurting hearts know you hear them—and you are sorry for their hurt. Nope. This is not about figuring out how to get over losing someone you love, or moving on, or “being all better” now. Healing is not about time. It’s about love that needs somewhere to go now. It’s about taking tiny steps of love to do ordinary, everyday stuff—both giving love and soaking it in as it comes. Don’t judge your pace, loves. Together, let’s celebrate our steps. This is all about loving through. Grief is such hard and beautiful heart work—love that needs somewhere to go now. Yep. Two years and beyond, the irreplaceable love that wells up inside of you from your person and for your person has new room to move. And that—maybe— is what has surprised me the most in the past several years. 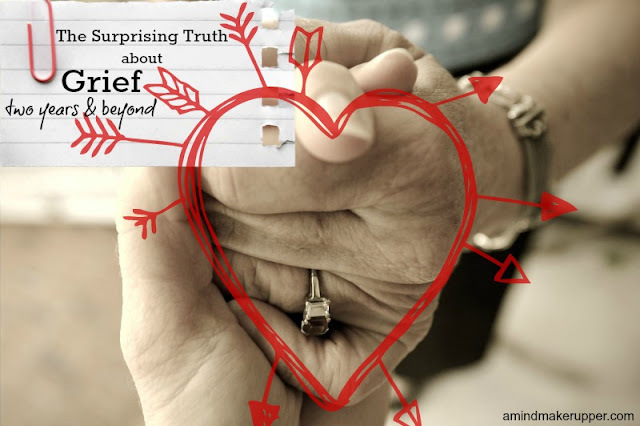 Grief has taught me more about love than I thought possible. I have come to understand the reality that love is not linear. Love is exponential and timeless. It cannot be contained or controlled. It’s wide-open and free and unpredictable, revealing itself in the most surprising times and ways. Love forgives and endures. It is not passive and inspires effort. It multiplies and ripples and connects us to each other wherever and whenever we choose it. Love is a life-long lesson that surpasses our knowledge and forever builds up all that is good. It’s the very reason why the worst things we go through don’t ever have to be the last. Because where and when there is love, there is also strength, restoration, and purpose. Loving deeply and losing is about growing your perspective from what you are used to seeing and doing to what you can’t see, learning to rely on the incomparable love you share instead of the physical person your heart misses so much. So friends, we have to encourage each other— to push ourselves—to not let fear—of what we can’t see anymore—win. The love you miss really is still there. And you and I feel it for a reason. We don’t ever have to stop loving the person we’ve lost. You don’t ever have to stop loving the person you’ve lost. Let it be your fuel. It’s our fuel. We need to remember it daily, reflect on it often, name it in all of it’s forms, and tap into it—wherever it leads us. Take time to pause here. Because loving deeply and losing means you have all this very unique love that needs new and special places to go, people to fill, and good purposes to build up. Because love is the only action that can move the broken pieces and use them to create a beautiful mosaic. This is where we find the power that heals our broken hearts. I have learned the truth—Love is always the bravest choice any of us can ever make. So let me encourage you that now is always the best time to love through. Give love without holding back, and allow yourself to be wide-open, to be loved no matter what, no matter who, no matter when, no matter where. It’s worth it. Looking back now, I can see it. Love is what matters. Always. And the good news is, it never dies.